News of the “Pink Wave” of women candidates was ubiquitous ahead of and after the first anniversary of the Women’s March. Cover stories and in-depth investigations into women running for office in 2018 rightfully celebrated the increase in the numbers of women running this year. At CAWP, we are the ones keeping those numbers, tracking potential candidates for Congress and statewide elected executive offices nationwide. We’re celebrating as well, thrilled to see women candidate numbers that are almost guaranteed to break records at every level. But we also know that there is more to this story, and ignoring important context in which to digest these candidate numbers risks inaccurate, and perhaps unfair, conclusions come Election Day. So before we go surfing this wave, here are a few currents to consider. 1. The surge in potential candidacies is not contained to women; more men are running too. And, like among women, the numbers of Democratic men likely to run for Congress has more than doubled from election 2016. We compared our list of potential candidates for the U.S. House and Senate at the start of the new year in both the 2016 and 2018 cycles. The number of Democratic male House candidates went up by 126%, while the number of Democratic female House candidates went up by 146% between these dates. Among potential Republican House candidates, the numbers for men went up 25% and women’s numbers increased by 35% at this point between the 2016 and 2018 cycles. These data reflect potential women candidates at the start of each election year, not the number of women candidates who ended up on the primary ballots (as filed candidates) in these cycles. Among likely Senate candidates, the gains are larger for women - Democrats and Republicans – than men from the 2016 to 2018 cycles, but women are not alone in increasing their numbers this year. 2. More women are running in 2018, but they are still less than a quarter of likely congressional candidates. 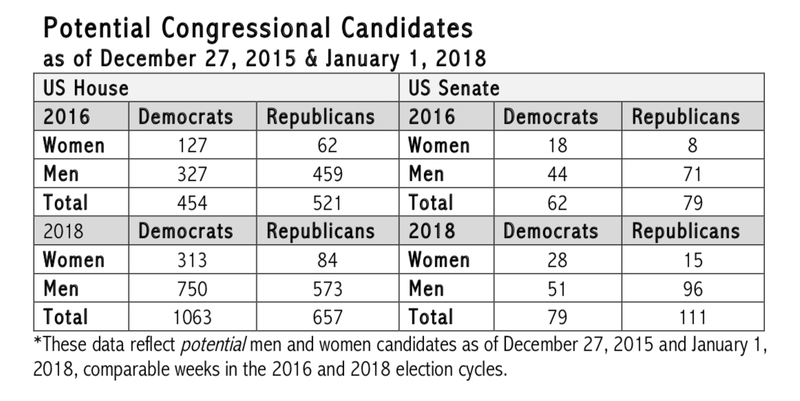 Based on CAWP’s database of potential congressional candidates, women are just 23% of all individuals that have indicated they may file to run in 2018. This is up from about 19% of all potential congressional candidates at this point in election 2016, but – needless to say – is far from representative of women’s share of the U.S. population (52%). The gain in women’s presence among the pool of likely candidates is notable, but may also be surprisingly low to many reading about a new “year of the woman.” When the rise among male candidates discussed above is taken into account, however, this makes much more sense. It’s only when women’s rise in candidacies significantly outpaces men’s that women will move closer to gender parity among potential congressional contenders. 3. The “Pink Wave” hues blue. The increases in women’s – and men’s – potential U.S. House candidacies are greatest among Democrats. Moreover, the representation of women among potential Democratic candidates for both the U.S. House and Senate is significantly higher than among potential Republican candidates, consistent with the disparities in representation among Democratic and Republican women in Congress today. As of January 1, 2018, women were just under 30% of potential Democratic candidates for the U.S. House and 35.4% of potential Democratic Senate contenders. In contrast, women were just 12.7% of potential Republican House candidates and 13.5% of potential Republican candidates for the U.S. Senate. Is this disparity consistent with previous cycles? Yes. The dearth of Republican women candidates is not unique to 2018. In fact, looking at the change in Democratic and Republican women’s proportions of their parties potential candidates from 2016 to 2018 shows the partisan story hasn’t changed much, especially among House contenders. The proportion of women among potential House Democratic candidates increased by about 1.5 percentage points from 2016 to 2018, while the proportion of women among potential House Republicans rose by three-quarters of a point. Among potential Senate candidates, the proportion of women among Democrats jumped by 6 points from 2016 to 2018, while the proportion of women among Republicans rose by just over 3 points. 4. Many women running are swimming against the tide. 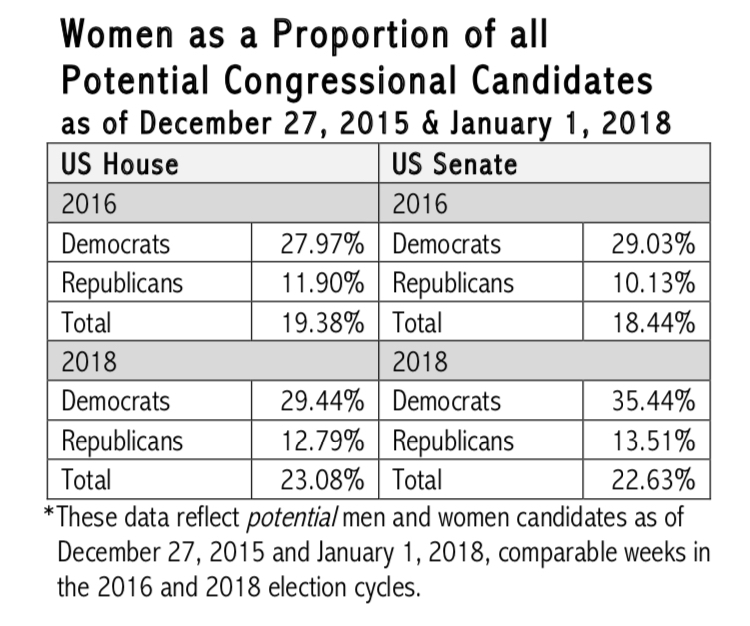 As of this week, 59% of all potential women candidates for the U.S. House and 61% of all potential women candidates for the U.S. Senate are seeking to unseat incumbents, whether in primaries or in the general election. At this point in the 2016 cycle, 41% of all potential women House candidates and 52% of potential women Senate contenders were running as challengers. By historical comparison, 51% of file women candidates for the U.S. House were challengers in 1992, the “year of the woman” when women nearly doubled their congressional representation. Celebrating the rise in women’s candidacies in 2018 is more than merited, but recognizing these electoral dynamics is important for a few reasons. First, being clear about the challenges women candidates will face in 2018 ensures that expectations of a drastic rise in women’s representation after Election Day are tempered and a more modest gain in women’s officeholding is not misinterpreted as a failure. Second, including men in our analyses provides a stark reminder of women’s overall underrepresentation among candidates and officeholders and, thus, the progress still left to make for women to reach parity with men in political power. Finally, these data should serve as motivation to push for greater women’s political empowerment on both sides of the aisle, both in this and future election cycles. This is not the first time CAWP has issued caution ahead of a proposed "Year of the Woman." Check out this fall 1992 newsletter column from CAWP founder Ruth Mandel, which struck a similar tone. That year, women did nearly double their numbers in Congress, but remained just 10% of all members of Congress. Too much to do and too little time this holiday season? 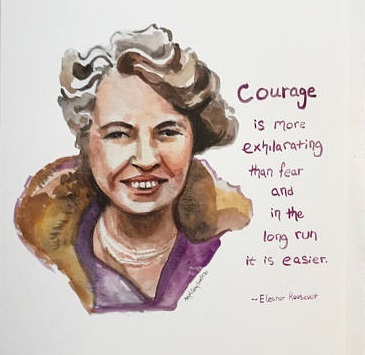 To help lighten the load, here’s a handy list of gift ideas honoring women public leaders – perfect for the women (and men!) in your life who appreciate the role that women play in shaping our democracy, as well as the kids who will carry the leadership torch in years to come. 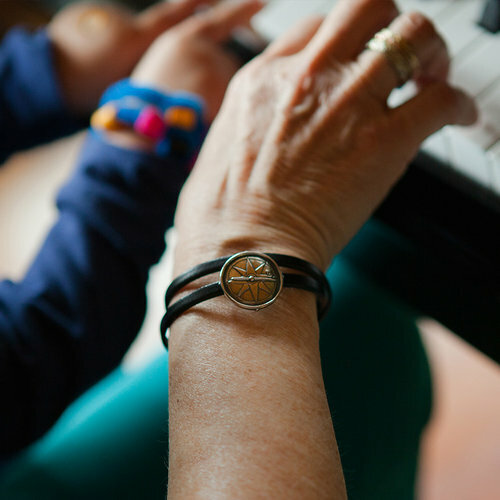 TheCOMPASSProject has designed a collection of special artisan-crafted True North bracelets, and a portion of sales supports CAWP’s Ready to Run® Network of nonpartisan campaign trainings for women. We wear our bracelets every day as a symbol of hope that one day women in America will have the power to govern as equals. Yes, this is a shameless plug to support our work, but you’ll also help women break some marble ceilings while shopping. See, everyone wins! 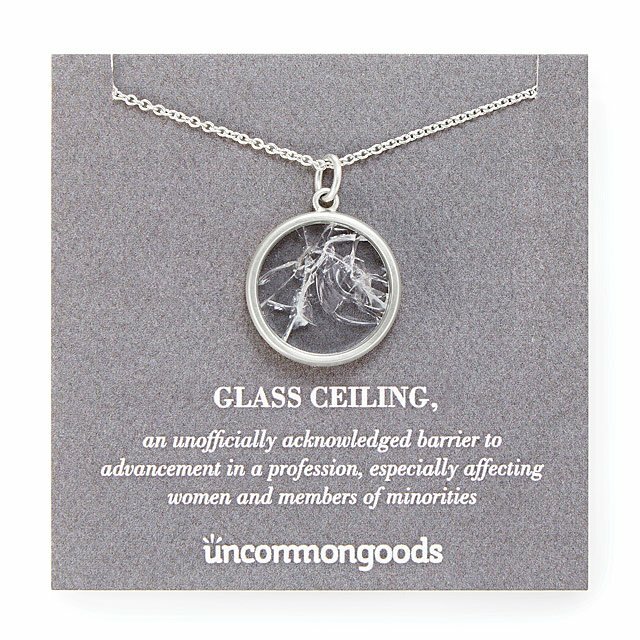 Speaking of ceilings, this shattered glass ceiling necklace pays tribute to the accomplishments of empowered women everywhere. Enough said. Every baby needs this Ruth Bader Ginsburg bib, because it’s never too early to start kids on embodying the spirit of powerful women. 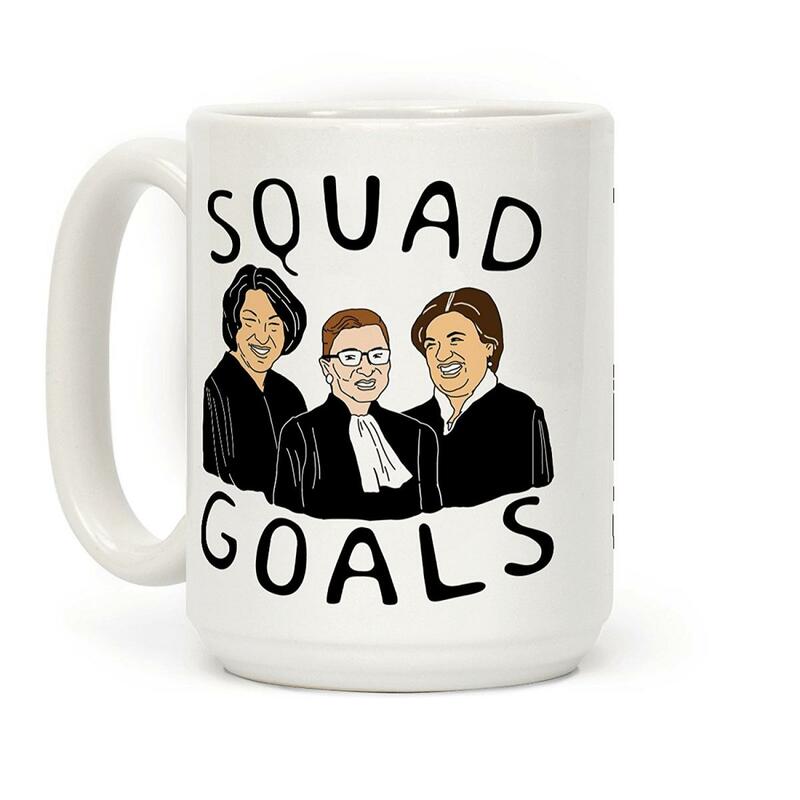 We can’t all be on the Supreme Court, but we can enjoy a cup of coffee with this record-breaking, history-making squad any time we’d like. These coasters would make a charming and empowering hostess gift. Also, I’m now obsessed with this “brilliant women” spinner. Statement t-shirts are fun; why not make them empowering ones? Suffragist Alice Paul said, “There is nothing complicated about ordinary equality,” and we agree. Every woman has a mind of her own. And in case anyone needs reminding about where women belong. What better way to spend a cold winter’s night than curled up in front of a good show? Equity is about the hard road women face making it in a man’s world. The binge-worthy drama Borgen covers challenges faced by Denmark’s first female prime minister. 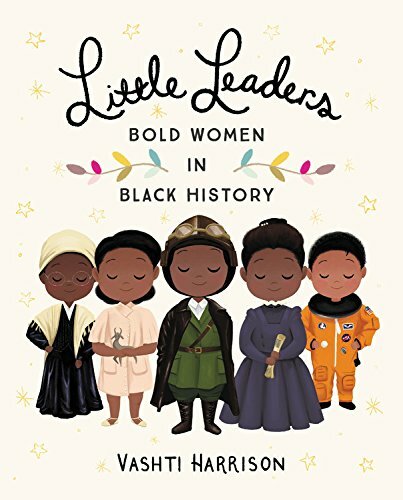 Preschool and Elementary: Little Leaders: Bold Women in Black History by Vashti Harrison; She Persisted: 13 American Women Who Changed the World by Chelsea Clinton and Alexandra Boiger; Sonia Sotomayor: A Judge Grows in the Bronx/La juez que crecio en el Bronx by Jonah Winter; Grace for President by Kelly DiPucchio ; If I Were President by Catherine Stier; Child of the Civil Rights Movement by Paula Young Shelton and Raul Colon. Founding Mothers: Remembering the Ladies by Cokie Roberts and Diane Goode; Mary America: First Girl President of the United States by Carole Marsh; Hillary Rodham Clinton: Do All the Good You Can by Cynthia Levinson; A Woman for President: The Story of Victoria Woodhull by Kathleen Krull and Jane Dyer. Pre-Teen: Yours Truly, Lucy B. Parker: Vote for Me! 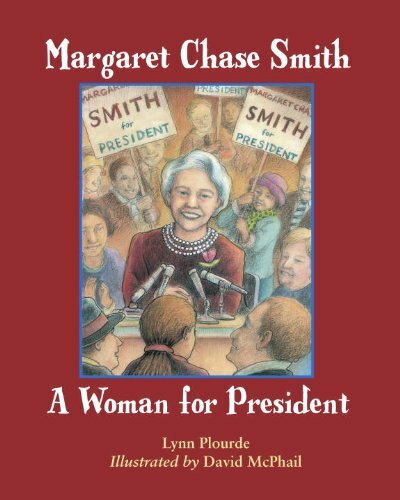 by Robin Palmer; With Courage and Cloth: Winning the Fight for a Woman's Right to Vote by Ann Bausum; Scholastic Biography: Sojourner Truth: Ain’t I A Woman by Patricia McKissack and Fredrick McKissack; President of the Whole Fifth Grade by Sherri Winston; Margaret Chase Smith: A Woman for President by Lynn Plourde. Teen: 33 Things Every Girl Should Know About Women's History: From Suffragettes to Skirt Lengths to the E.R.A. by Tonya Bolden (editor); Not for Ourselves Alone: The Story of Elizabeth Cady Stanton and Susan B. Anthony by Geoffrey C. Ward and‎ Kenneth Burns; Still I Rise: The Persistence of Phenomenal Women by Marlene Wagman-Geller. Adult: Pearls, Politics, and Power: How Women Can Win and Lead by Madeleine Kunin; Political Woman: The Big Little Life of Jeane Kirkpatrick by Peter Collier; Unbought and Unbossed by Shirley Chisholm; My Beloved World by Sonia Sotomayor; Mankiller: A Chief and Her People by Wilma Mankiller; Fighting for Common Ground: How We Can Fix the Stalemate in Congress by Olympia Snowe; The Autobiography Of Eleanor Roosevelt. Nearly one-third of women challengers won in Virginia’s state legislative election. Here are some more numbers that might surprise you. Thirty women challengers ran for Virginia’s House of Delegates on Tuesday; all but three were Democrats. Of those thirty, nine (30%) – all Democrats – won, and one Democratic woman’s race is too close to call. This success rate for challengers is rare. 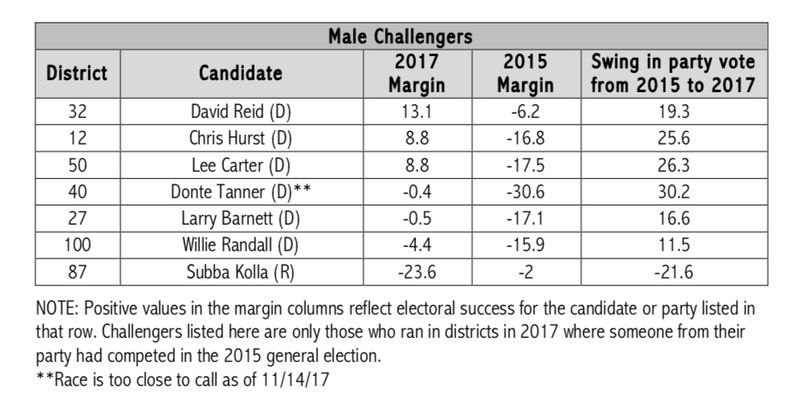 In fact, while 24 men ran as challengers in 2017, just 3 (12.5%) were successful. One male challenger’s contest is still too close to call. Put differently, women were 56% of all challengers, but 75% of the successful challengers in Virginia’s House of Delegate races this year. Sometimes high risk does reap high rewards. Some women who ran as challengers in races previously uncontested by Democrats surprised many with their success. Wide swings in Democratic support from 2015 to 2017 were key to victories for men and women challengers. These dynamics upended conventional wisdom that challengers’ success would be highly unlikely. Republican challengers were few in number and confronted strong headwinds. Just one new Republican woman was elected in Virginia’s House of Delegates, and she won an open seat. 1. Sometimes high risk does reap high rewards. In 2017, Democratic candidates challenged Republicans in 31 Virginia House districts where those Republicans ran unopposed in 2015. They took on high risks, as the precedent in each of these districts indicated slim chances of success. The results were largely as expected, but four of these challengers won. Importantly, they were all women. Their margins of victory ranged from two to 16 points. 2. Wide swings in Democratic support from 2015 to 2017 were key to victories for men and women challengers. Democratic challengers competed in 17 districts where their Republican opponents had also been challenged in 2015, and they won in about half of them. 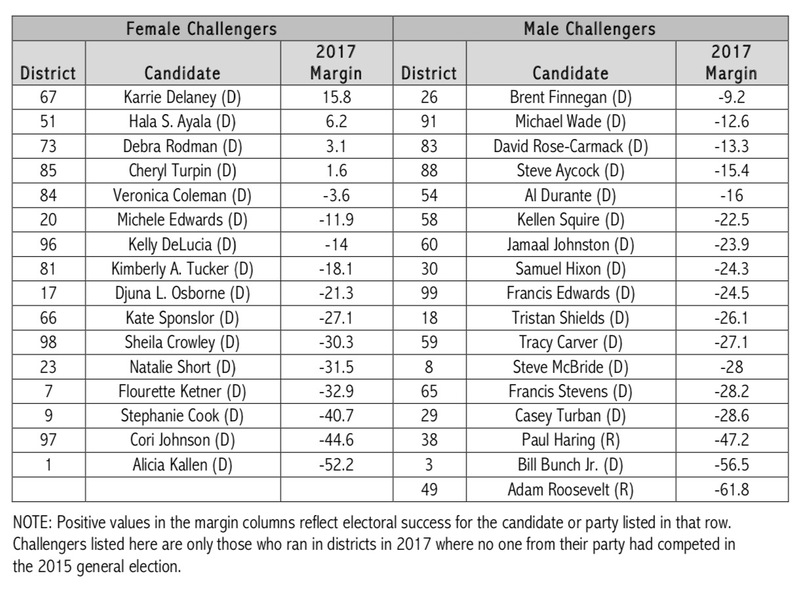 Women were nearly two-thirds (11 of 17) of those challengers, and are the same proportion of the winners of these contests; five women and three men won, and both a man and a woman are candidates in races where the results are too close to call. 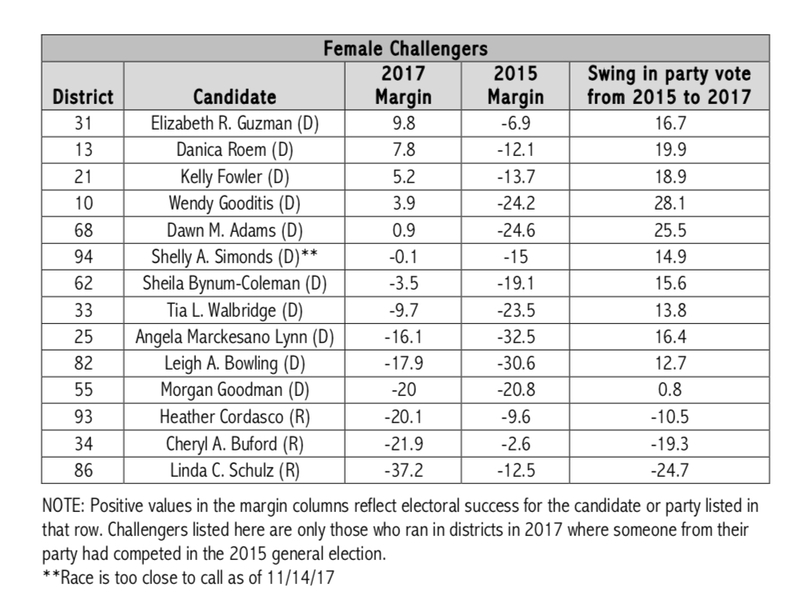 The average margin of victory for the five successful Democratic woman challengers was 5.5 points (ranging from 0.9 to 9.8 points), and these women, on average, swung their districts’ voter support 21.8 points from 2015 to 2017 (ranging from 16.7 to 28.1 points). The three successful male challengers, on average, swung their districts 23.7 points from 2015 to 2017 (ranging from 19.3 to 26.3 points). Even where they were unsuccessful, Democratic challengers narrowed margins of defeat from 2015 to 2017. On average, the five defeated women challengers in these contests cut the Republican advantage in their districts by 11.9 points (ranging from 0.8 to 16.4 points), and the two defeated men cut the Republican advantage in their districts by an average of 14.1 points. 3. Republican challengers were few in number and confronted strong headwinds. Just six Republican challengers, three women and three men, competed in Virginia’s elections, representing 11% of all House challengers in 2017. All of them lost, and by much larger margins than had Republicans competing in the same districts in 2015. The average margin of defeat for the three Republican women challengers in 2017 was 26.4 points (ranging from 20.1 to 37.2 points). In 2015, the average margin of defeat for Republican women nominees in those districts was 8.2 points (ranging from 2.6 to 12.5 points). In each of these districts, Republican women lost ground - anywhere from 10.5 to 24.7 points in support - between 2015 and 2017. The average margin of defeat for the three Republican men challengers in 2017 was 4.2 points (ranging from 23.6 to 61.8 points). In only one of these districts was there a Republican candidate in 2015; in that race (District 87), the Republican nominee was defeated by 2 points in 2015, but 23.6 points in 2017. How do these findings compare to women’s candidacies for open seats and as incumbents? Three of the six women candidates running for open seats in Virginia’s House of Delegates won on Tuesday, including two Democrats and one Republican. Importantly, two of the four open seat contests in which women competed were woman vs. woman races. The most striking swing between 2015 and 2017 occurred in District 42, where Democrat Kathy Tran won a seat by 22 points that had been won by the Republican incumbent by 27 points in 2015, yielding a nearly 50 point swing. In District 2, Democrat Jennifer Carrol Foy defeated her Republican opponent by 26 points. In 2015, the Democratic nominee in that district was defeated by 1 point. Emily Brewer was the only new Republican woman elected to the House of Delegates in 2017. She defeated her Democratic opponent by 25 points in a district where the Republican incumbent had run unopposed in 2015. Finally, all of the 15 incumbent women candidates in Virginia, including 11 Democrats and 4 Republicans, were re-elected. Nine (8D, 1R) were unopposed. Consistent with the trends across races, Democratic women incumbents increased their margins of success from 2015 (except for in cases where they were opposed in 2017 and not in 2015), and Republican women’s margins of success narrowed in 2017, in one case to just 0.5 points. Read more about Nearly one-third of women challengers won in Virginia’s state legislative election. Here are some more numbers that might surprise you. 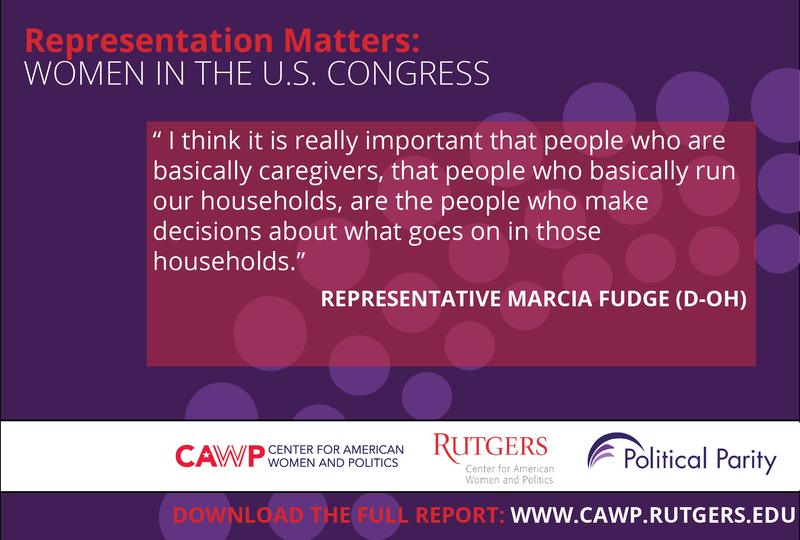 Between September 2015 and August 2016, our research team at the Center for American Women and Politics (CAWP) at Rutgers University-New Brunswick conducted interviews with 83 of the 108 women who served in the 114th Congress. 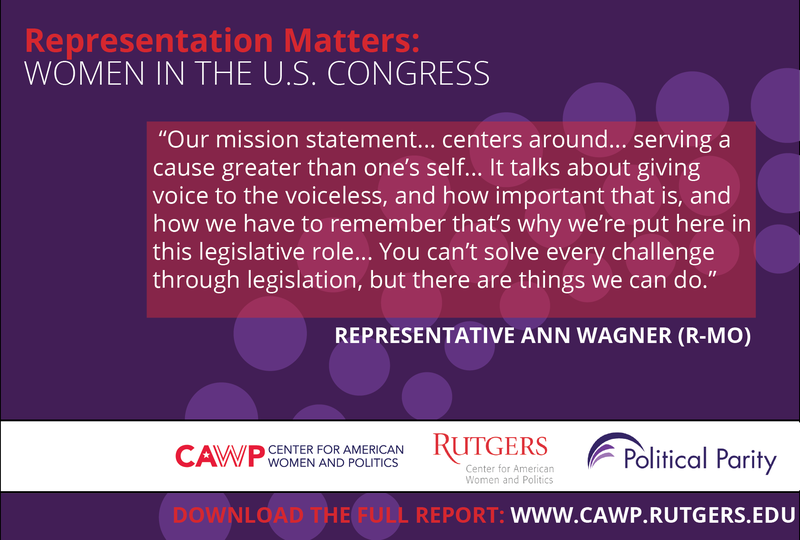 The information we gathered from over 40 hours of member interviews is outlined in our recent report, Representation Matters: Women in the U.S. Congress. Included among our findings are key insights from congresswomen that not only demonstrate why it matters that a diverse group of women hold elective offices, but also make the case that this form of political power is worth fighting for, whether on the campaign trail or within policymaking institutions. Democratic Leader Nancy Pelosi (D-CA) told us, “I do know this. This is not for the faint of heart, and you really have to be ready to make the fight.” But she added, “It’s worth it. It’s necessary for our country.” She is right, and below are some useful observations from the other congresswomen we interviewed that further make the case for women’s political representation. We hope you will draw from these “5 Reasons More Women Should Run for Office” to encourage women to consider candidacy, urge others to support women’s representation, and contribute to the work already being done to increase the numbers of women in elected office nationwide. 1. Public service provides significant opportunities for women - including the opportunity to bring issues to policy agendas that would not otherwise be there. 2. Women also bring distinct and diverse perspectives to legislative debates, often rooted in their own experiences. Elected women don't just shed light on certain issues that might otherwise be ignored; they also contribute perspectives to legislative debates that otherwise might not be heard. Rooted in their own experiences as women, women bring diverse, credible, and authentic voices to policymaking. Representative Linda Sanchez (D-CA) noted how her perspective as a woman contributes to policy debates: “[B]ecause I am a woman I do think that I look... at legislation...and policy through the prism of ‘How does this impact women?’” But congresswomen rarely view policies through a singular lens of gender. Instead, they bring the plurality of their life experiences and identities to policy engagement. 3. Women act as a voice for the voiceless, using their power as elected officials to advocate for those who are too often ignored in the halls of power. The women on whose behalf Representative Lee (D-CA) speaks are among those populations that are often voiceless in policymaking institutions. Our interviews indicate that women – across parties, backgrounds, and chambers – are particularly motivated to give voice to underrepresented groups in their legislative work. 4. Elected women change the face of political leadership and use their positions to encourage and empower other women. 5. Women get things done, even in today’s polarized political environment. 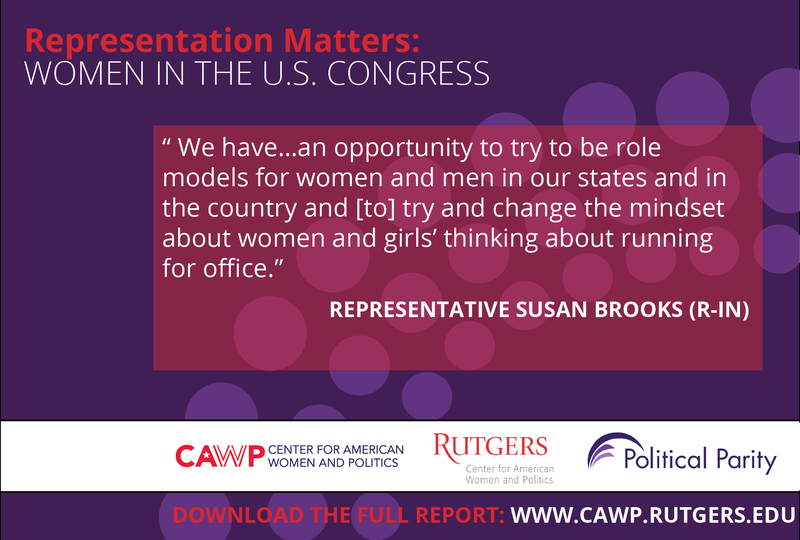 CAWP research on state legislators shows that the primary motivation for women to run for office is a desire to make policy change. It’s no surprise, then, that women look at today’s politics and are deterred; when the narrative and evidence of gridlock and unproductivity prevail, women will look to other sites to make a difference. But the congresswomen we spoke with gave us many examples of accomplishment despite the polarized political environment in which they work. They emphasized that women’s results-oriented approach is effective in Congress, demonstrating the need for more women to run for and serve in elected offices at all levels. Few would argue against having more members of the “Get-‘er-Done Caucus” in today’s Congress, and in legislative bodies nationwide. Women are poised to fill those roles. Based on two important measures of clout, the number of women serving in party leadership and as committee chairs, Republican women’s voice as leaders in formulating in those “big things” promised by the Speaker may be muted. However, their voice as messengers to articulate the Party’s vision may be more prominent as Republicans continue to grapple with expanding their base of voters to include more women. Come January, Republican women will again serve in the majority but in slightly smaller numbers than they did in the previous Congress with two fewer members. Twenty-one Republican women will serve in the House. Kelly Ayotte, the sole Republican woman senator up for re-election in this cycle, lost her race which brings the total number of Republican women senators serving in the institution to five. Republican women in both chambers account for less than 10 percent of their party’s caucuses. By comparison, Democratic women members significantly outnumber their Republican counterparts and, by virtue of the party’s minority status with fewer Democratic members, account for a much larger percentage, about a third, of their party’s caucuses in each chamber. Further, Republican women’s underrepresentation is also seen by their general absence in party leadership and as committee chairs. Republican party leadership in the House and Senate is almost entirely comprised of white men. Cathy McMorris Rodgers was renamed as House Republican Conference Chair while Mimi Walters was named as sophomore representative. Of the nearly two dozen House committees, only two Republican women will serve as chairs; Virginia Foxx will chair the Committee on Education and the Workforce, and Susan Brooks will chair the Committee on Ethics. Two Republican women will chair Senate committees – Lisa Murkowski on Energy and Natural Resources, and Susan Collins on Aging. There are no Republican women in formal Senate leadership positions, although in the 114th Congress Senate Majority Leader Mitch McConnell appointed four “counsels” to broaden Senate leadership, two of whom were women. Previously, Republicans were open in recognizing the importance of women leaders. Indeed, in 2014, House Republican Conference Chairwoman Cathy McMorris Rodgers stated, “Messengers are important, and having a broad spectrum of members who represent that background – youth, women, Hispanics, every walk of life – is important.” More recently, however, Republicans have not only rejected the idea of gender diversity within the Party as a goal but dismissed it as “identity politics” embraced by the losing Democrats. Republican pollster and Trump campaign manager, Kellyanne Conway, agreed with Bernie Sanders who recently called on Democrats to move away from “identity politics.” Sanders advocated for a focus on progressive issues instead. Republican women seeking elective office may have cause to downplay their gender on the campaign trail. Danielle Thomsen finds that Republican women candidates are disadvantaged in contested primaries as they are incorrectly perceived to be less conservative than their male primary opponents. Moreover, in the important area of campaign fundraising, Melody Crowder-Meyer and Rosalyn Cooperman find that Democratic and Republican donors differentially prioritize using money to increase the number of women representatives. Karin Kitchens and Michele Swers find that campaign finance networks available to Republican women candidates, particularly in primaries, is significantly underdeveloped. For their part, rank and file Republicans express a similar disinterest in gender diversity. In an October 2016 Public Religion Research Institute (PRRI) survey, a majority of Americans (58 percent) believe the country would be better off if there were more women serving in public office. However, the support for women serving differs significantly based on respondents’ party affiliation. More than three quarters (77 percent) of Democrats agree but fewer than four in ten (37 percent) of Republicans – including only 42 percent of Republican women – agree that the country would be better off with more women holding public office. In other words, if anyone is bothered by the low profile of Republican women members in the Republican-led Congress, it’s probably not Republicans. And yet despite these myriad challenges, Republican women members will likely serve an important and highly visible role in promoting the Party’s message in the 115th Congress, particularly in articulating components of the House Republicans’ “Better Way” vision and Republican Party policy messages more broadly. Melissa Deckman’s work on Tea Party women illustrates how conservative women frame conservative issues in women-friendly ways. For example, women leaders on the right argue that cutting taxes is good for American families as it allows them to spend money as they best see fit; or, they maintain that lowering the national debt safeguards future generations. As congressional Republicans work to address policy priorities like replacing the Affordable Care Act, reforming the tax code, or overhauling immigration regulations, Republican women members are particularly well suited to articulate why these policies will benefit American families. In the 2016 election, Republicans performed exceptionally well with white working class men and women. Even so, the Party faces challenges in appealing to women voters, particularly college-educated women and women of color, as it becomes an even whiter, mostly male party in its leadership. 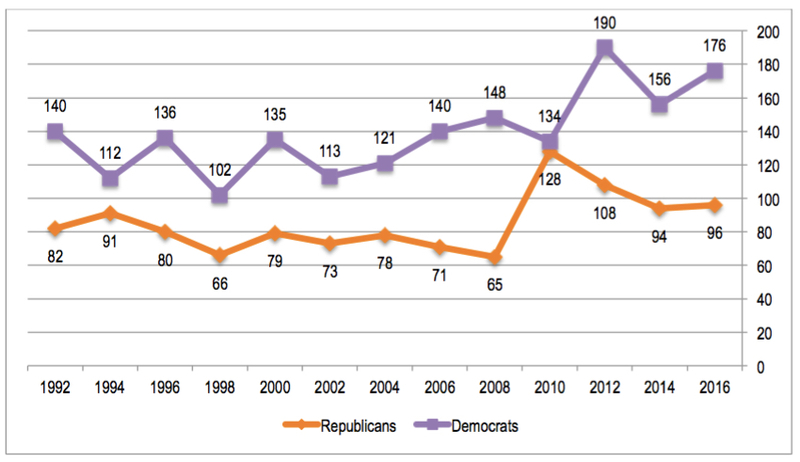 In the 115th Congress there will be fewer Republican women members than in Congresses past. Despite the Party’s rejection of identity politics, party leaders will likely rely heavily on these Republican women members to articulate a policy vision that is both women and family friendly if they wish to remain in control of Congress. At the Center for American Women and Politics (CAWP), we have been getting a lot of inquiries about how to get politically engaged and how to encourage other women to do so. Below is a list of ideas and action steps to keep you inspired and engaged. Please share widely, and contact me if you have other ideas I should add. Happy holidays! 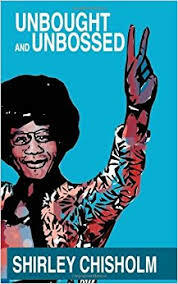 The late Congresswoman Shirley Chisholm said: “If they don't give you a seat at the table, bring a folding chair.” The fastest and most effective way to make change at policymaking tables is to sit there. Help women take their seats by helping build and sustain the infrastructure needed for women to be successful public leaders. Run for office. Sign up for a campaign training program in your area. 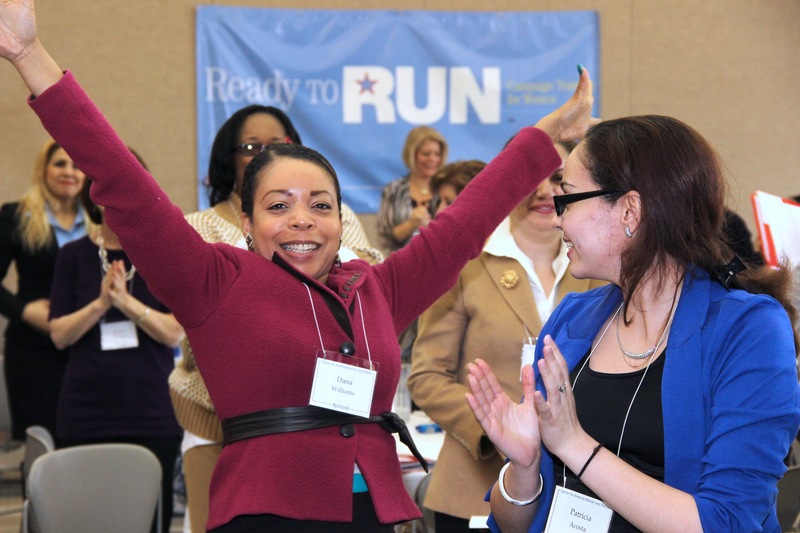 CAWP has a National Network of Ready to Run® Campaign Trainings for Women around the country. If there’s not one in your state, check out our map of political and leadership resources for women. There are a whole host of organizations, including She Should Run, Emerge America, the Excellence in Public Service Series, and more. Check them out! Ask a woman to run. And then tell her you will help her, and find others to help her (and follow through.) And then ask another woman. And another. And another, and…well, you get the idea. If you are already an elected official, it’s particularly important to encourage a woman (or women) you know to run for office. Research that shows that women are far less likely than men to get asked to run for office by formal political actors, including other elected officials and party leaders. Your encouragement could make all the difference. Thank you for your service! Start a campaign training program to encourage other women to run. Connect with CAWP on how to launch Ready to Run® in your state. Our programs are nonpartisan, but if party or certain issues are your thing, check out any of the organizations mentioned or on our map. Get appointed to office. Did you know that there are hundreds of thousands of positions available on state, county and local boards and commissions around the country? Did you also know that appointed positions often have significant policymaking authority? Start researching the boards and commissions in your town, county, or state and find out how to get appointed to the ones that interest you. Feel overwhelmed about how to start? One of the best pieces of advice I ever heard was from a woman who was concerned about an environmental issue in her town. She found the local commission responsible for overseeing that issue and made a point of showing up at each meeting and asking at least one questions publicly. She began to build her public profile on that issue. She eventually became a member of that commission. Start a project to encourage other women to seek appointive office. During open gubernatorial election years, CAWP runs a Bipartisan Coalition for Women’s Appointments here in New Jersey. The goals are: to create the expectation within both major parties and the campaigns of their gubernatorial candidates that women will be included in significant state government positions in even greater numbers than in any past administration at every level of appointment – from cabinet positions to unpaid boards and commissions; and to create a “talent bank” of resumes from New Jersey women interested in being considered for appointments in the next administration.Other states have had appointments projects. Interested in creating one in your state? Contact me. Read this case study on New Jersey by scholars Susan J. Carroll and Kelly Dittmar. It examines the reasons why New Jersey was able to rise from the bottom ten of all states for women serving in its legislature to the top of the pile (we currently rank 11th.) It was mix of factors, but one thing is for certain: change required intervention and lots of people paying attention. Use it to start discussions with other women leaders in your state about how to build a political infrastructure supportive of women candidates. Start, join, and support an organization dedicated to political parity. A number of groups exist all over the country, including the ones mentioned earlier, but also the National Women’s Political Caucus, Higher Heights for America, Hispanas Organized for Political Equality (HOPE), the National Congress of Black Women, and many more. Look for resources in your state on our resource map; if there isn’t an organization, think about creating the infrastructure yourself. Over the years, I’ve met women from around the country who took a look around their state and realized that there wasn’t an organization or network dedicated to women’s public leadership or parity, so they started their own. Women Lead Arkansas and the Institute for Women in Politics of Northwest Florida are just two examples. It takes a lot of work, but we need more of us. Join your party organization. Information can be found on the national Democratic and Republican party organization sites. Seek party leadership position. If you are already a member of a political party, seek out an official leadership role with the party organization. In New Jersey, for example, all but two counties have male party chairs. Time for some women at the helm. If you are already a party leader, take the time to mentor women who could come along the leadership ladder with you. (See #2 above.) Lift as you climb! Give as much as you can, depending on your circumstances. I guarantee you, no amount is too small. Give more if you are in a position to. But seriously, money talks. Give money to the people and causes you support. Try to make it a regular part of your giving – not just at election time, but all throughout the year. Women candidates face challenges raising money, according to Open Secrets.org. Give to women candidates. Even if they don’t live in your district, it’s worth supporting women candidates whose values match yours. You can always find a list of women candidates on CAWP’s Election Watch page – do research on the ones that may be a fit for you. Organizations like Women Count, Maggie’s List, Higher Heights for America, as well as other political action committees (PACs), are useful resources for giving to and finding women candidates. A full list of PACs supporting women candidates can be found on our Political & Leadership Resource Map. Start a PAC supporting women candidates. Here’s a quick answer guide from the Federal Election Commission, but for state or local PACs, you will want to check your state’s election commission for state-specific rules and guidelines. Campaigns for federal office are governed by federal rules, while campaigns within a state are governed by the rules of the state. Give money to advocacy organizations focused on issues you believe in. Pick at least one or two causes that are most important to you, and find the organizations that best meet your goals on those issues. Sign up to be a regular supporter – remember, no amount is too small. Once a year, evaluate your advocacy giving and readjust. Can you give more? Are there other issues about which you have become passionate? Follow the money. Use OpenSecrets.org, a project of the Center for Responsive Politics, to look up where candidates or PACs are getting their money and how they are spending it. Use this to make informed decisions about where to spend your own money and to advocate for transparency in campaign finance. Support the work of research centers and scholars dedicated to studying women’s public leadership. Well, this is an outright ask: we need your support. The Center for American Women and Politics has been dedicated to examining and tracking women’s political participation over the past 45 years. We simply cannot do this work without the support of our generous donors. Other organizations include the Pennsylvania Center for Women and Politics at Chatham University, the Carrie Chapman Catt Center at Iowa State University, the Center for Women’s Leadership at Portland State University, the Sue Shear Institute for Women in Public Life at the University of Missouri-St. Louis. Many more can be found at our Political & Leadership Resource Map. Our democracy hinges on participation from many people. If you are not running for office, you can have a voice in legislative processes in a variety of ways. Give testimony at legislative hearings. Anyone can sign up to give testimony at a hearing. Make your voice heard. Do your research and prepare your remarks. Here’s a handy guide from the Oregon Legislature on how to give testimony. It’s more important than ever to provide the tools and resources to help young people rethink leadership and refocus the picture, because if a girl can’t imagine a woman leader, how can she become one? And if a boy sees only men in leadership roles, what will convince him to support aspiring women leaders? Invite a woman public leader to speak to your classroom or youth group. CAWP created our Teach a Girl to Lead™ (TAG) project to make women’s public leadership visible to the next generation. What better way to do that than have women public leaders talk to kids about politics and government? For sample invitation letters and discussion points, go here. Assign readings on women's political leadership to students, or read with your kids. Plenty of book suggestions by age, from kindergarten through adults, can be found here. Have a family movie night coming up? Suggestions can be found here. Arrange to take a class or youth group on a statehouse tour with a gender lens. Incorporate these exercises and activities about women’s public leadership in classrooms or youth programs. Talk to kids about politics and government. Explain, early and often, what it means to be a good citizen and to be part of a participatory democracy. Answer their questions. Take them with you to legislative hearings and other public events. Point out city hall when you drive by. Tell them why you served on jury duty recently. Talk about things you like and things you’d like to change in your government. Make public service and government a regular part of life for them. Support organizations dedicated to building girls’ political leadership. Our Teach a Girl to Lead™ project needs your support to continue to provide new resources and programs. There are also several organizations dedicated to girls political leadership, including IGNITE, Running Start, and the Girls and Politics Institute. Spread the word. Donate scholarships to make it possible for more girls, particularly those from underserved populations, to participate. Donate to our Teach a Girl to Lead™ project! Sometimes you need inspiration or advice on your road to public leadership. Find your own public voice. Lots of people are nervous about public speaking, but you have to be able to articulate your message and inspire your audience. Learn how to do that by reading The Well-Spoken Woman by expert Christine Jahnke. Watch women public leaders tell you their stories on MAKERS.com. You can find more video conversations with women leaders here. Above all, get and stay involved. Go forth and lead! In 2016, 2602 women are state legislative nominees in the 44 states holding state legislative elections, marking a new record. This number only includes major party nominees (1702D, 891R), non-partisan nominees in Nebraska (5), and third-party nominees who are incumbents (4 independents). This year, 482 (297D, 180R, 5NP) women are nominees for state senate seats and 2120 (1405D, 711R, 4I) are nominees for state house seats. Three hundred and two (192D, 105R, 4NP, 1I) additional women are holdovers that are guaranteed seats in 2017. The highest number of women nominees for state legislative seats since CAWP began tracking these numbers was 2537, set in 2010 – a year in which 46 states held legislative elections. Thus, even in a year where fewer state legislative seats are being contested, more women will be on the ballot. 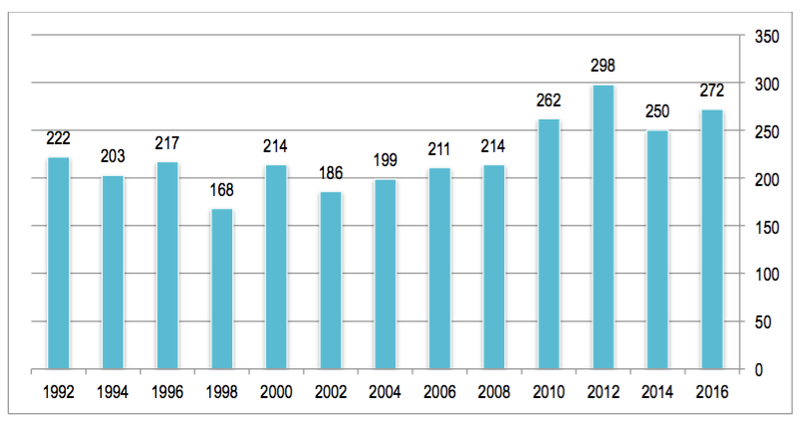 Of the 2602 women nominees running this year, 1208, or 46.4%, are incumbents. Seven hundred and fifty-seven women, or 29.1%, are running as challengers and 637 women, or 24.5%, are running in open seat contests. Among female state house nominees, 46.2% are running as incumbents, 30% are running as challengers, and 24.8% are running in open seat contests. Among female state senate nominees, 47.5% are incumbents, 29.4% are running as challengers, and 23% are running in open seat contests. The number of Democratic women state legislative nominees in 2016 (1702) is the greatest we’ve recorded, up from the previous high of 1625 in election 2014. The number of Republican women nominated this year (891) is up only one from the number on the ballot in 2014 (890). This does not mark a record high for Republican women state legislative nominees since we began tracking these numbers in 1992. While the overall trend between and across parties is one of relative stasis, as is evident in the flat lines in the graphs above and below, the increase in Democratic women nominees this year may foreshadow a more significant increase in women’s state legislative representation in 2017. Today, 1805 (1081D, 705R, 11NP, 7I) women serve in state legislatures, including 442 (263D, 167R, 11NP, 1I) female state senators and 1363 (819D, 538R, 6I) female members of state houses. They represent 24.4% of all 7383 state legislators nationwide. The percentage of women state legislators has remained nearly flat over the past two decades, as is evident in the line graph below. 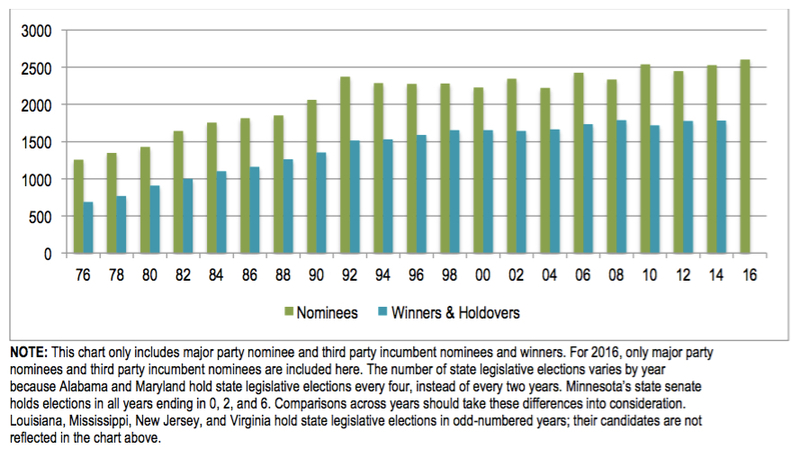 As the chart above shows, women’s state legislative representation increases as the number of women nominees rises. With a rising number of women nominees this year, we should see an increase in women’s state legislative representation. Currently, 398 (367D, 30R, 1NP) women state legislators, or 21.9% of all women legislators, are women of color. Because we are unable to track the race of state legislative candidates prior to Election Day, we do not know the racial identification and breakdown of women nominees this year. CAWP will be tracking the numbers of women winning state legislative seats on Election Day to determine how women fare nationally, by chamber, by state, and by party. We will monitor trends in women’s representation and watch for shifts in the balance of partisan power in state legislative chambers, especially where women hold top leadership positions. No state legislative elections will be held this year in AL, LA, MD, MS, NJ, and VA.
 Because AL and MD hold state legislative elections every four years and LA, MS, NJ, and VA hold state legislative elections in odd-numbered, only 44 states are holding state legislative elections this year. Minnesota’s state senate holds elections in all years ending in 0, 2, and 6. While we know that eleven current women members (8D, 3R) are leaving because of retirements, primary losses, and bids for other offices, four women candidates (3D, 1R) are very likely to become new members of the 115th Congress, based on the most recent ratings from the Cook Political Report. Democratic women candidates are much better represented among the remaining prospects for the 115th freshman class. Another two Democratic women newcomers (2D) are rated as likely or leaning to win House seats this year. Finally, 10 possible new women members (9D, 1R) are competing in contests rated as toss-ups by the Cook Political Report as of this week, with only one Republican among them. Two of these women are competing against each other in the competitive race for the open seat in New York’s 22nd district. There are currently no women incumbents in races deemed as toss-ups or possible losses, though Republicans Mia Love (R-UT) and Barbara Comstock (R-VA) are in the most vulnerable (labeled “lean Republican” by Cook) races this year. Based on these numbers, the number of Republican women in the U.S. House will almost certainly decline from the 114th to the 115th Congress; including a win in a toss-up race for Republican candidate Claudia Tenney (NY-22), Republican women are favored to win 21 seats this year, down from the 22 currently serving in the U.S. House. While this year saw a record number of women filing for Senate races, November’s ballots won’t offer a record number of women nominees. Still, depending on how the most competitive races of the cycle break on November 8th, we may see a net increase in the number of women serving in the U.S. Senate in January 2017. Forty (28D, 12R) women filed to run for the U.S. Senate in 2016. The previous record number of women filing for the Senate was 36, set in 2010 (19D, 17R) and reached again in 2012 (20D, 16R). This year, 15 (11D, 4R) women have won their primaries, and Caroline Fayard (D) will be on the November 8th ballot in Louisiana’s same-day primary for the state’s open Senate seat. The record for women Senate nominees was set in 2012, with 18 women (12D, 6R) making it through their party primaries. 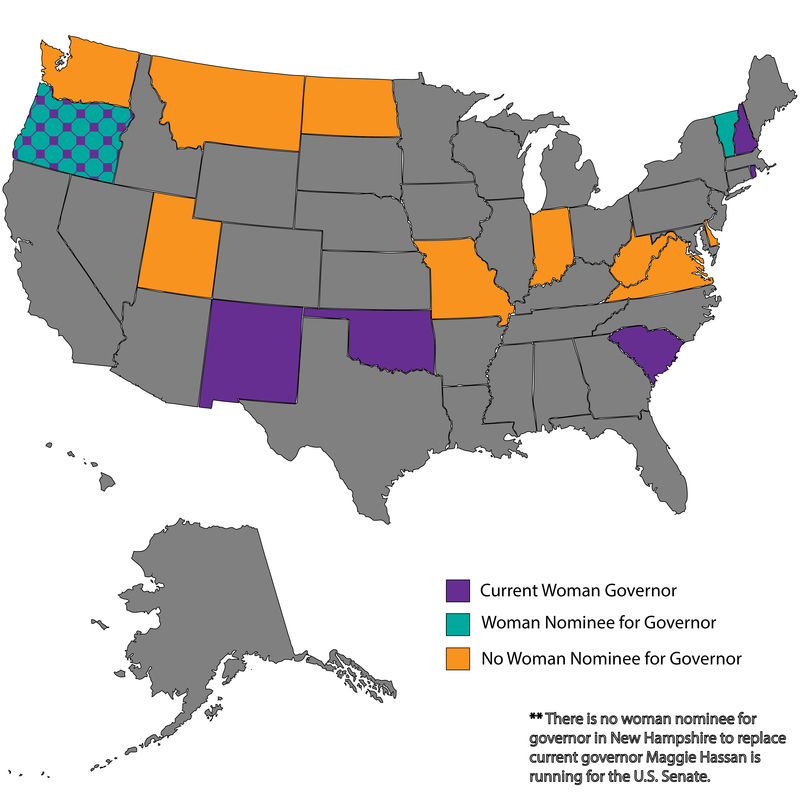 There are two woman–versus-woman Senate races this year: in California (Kamala Harris [D] v. Loretta Sanchez [D]) and New Hampshire (Kelly Ayotte [R] v. Maggie Hassan [D]). This year, more than twice as many Democratic as Republican women filed to run for the U.S. Senate. 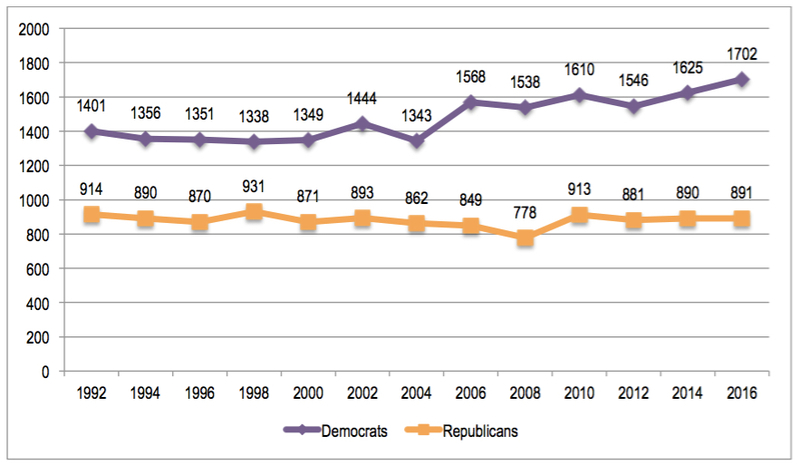 This is the largest partisan gap in female candidate filings in the past 24 years. Democrat women nominees also outnumber Republican women nominees this year with the largest partisan gap in female candidate nominations in over a decade. It’s important to look at the types of contests in which women are running to determine their likelihood of winning. In 2016, 4 (3D, 1R) women are nominees for open U.S. Senate seats, compared to the 7 (4D, 3R) women who ran for open seats in 2014 (1). Three incumbents are seeking re-election and eight women are running as challengers. Twenty (14D, 6R) women currently serve in the U.S. Senate. Two incumbent women senators stepping down this year, including the “Dean” of the U.S. Senate women, Barbara Mikulski (D-MD), and Barbara Boxer (D-CA). A new woman senator is guaranteed to be elected in California’s Senate race to replace Boxer, since the state’s top-two primary resulted in the nomination of two Democratic women – Kamala Harris and Loretta Sanchez. The winner of that race will become the first woman of color elected to the U.S. Senate from California and only the third woman of color ever to serve in the Senate from any state (2). A Sanchez victory would give the Senate its first Latina. Fifteen (11D, 4R) incumbent women senators are holdovers who will remain in office through the 115th Congress. Three (1D, 2R) incumbent women are up for re-election. Two of those women, Senators Lisa Murkowski (R-AK) and Patty Murray (D-WA) are likely to keep their seats. Senator Kelly Ayotte (R-NH) is engaged in a competitive bid for re-election against current New Hampshire Governor Maggie Hassan, but no matter the outcome, a woman will hold the NH seat. Their race is rated as a “toss-up” by the Cook Political Report. Based on the most recent ratings, Tammy Duckworth (D-IL) is favored slightly to win in her challenge against incumbent Illinois Senator Mark Kirk (R). 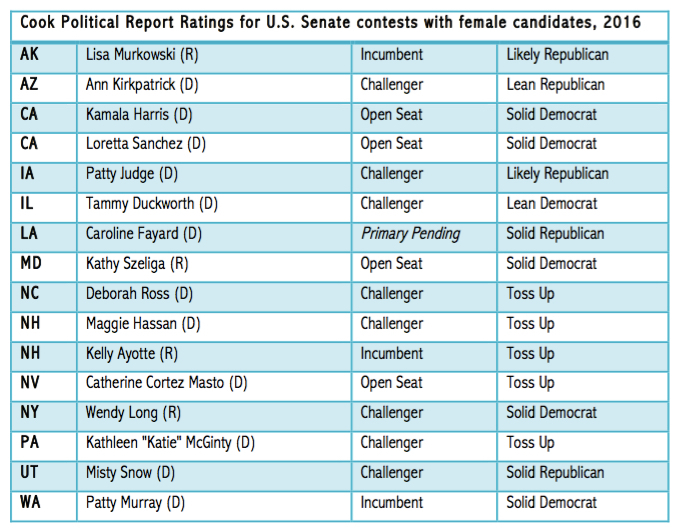 Three more women candidates for the U.S. Senate, all Democrats, are in contests rated as toss-ups by the Cook Political Report, including challengers Deborah Ross (NC) and Katie McGinty (PA), and Catherine Cortez Masto (NV), who is running for the open seat created by Senator Harry Reid’s (D) retirement. With major party nominees in four of the seven U.S. Senate races currently deemed toss-ups, women candidates will play a key role in determining the partisan balance of power in the U.S. Senate in 2017. The remaining six women nominees for U.S. Senate seats face strong headwinds going into November. According to the Cook Political Report ratings, the Arizona race in which Ann Kirkpatrick (D-AZ) bids to oust Senator John McCain (R-AZ) is leaning toward the incumbent. Patty Judge (D-IA) is rated likely to lose her challenge to incumbent Senator Chuck Grassley (R-IA). The contests of three more women nominees – Kathy Szeliga (R-MD), Wendy Long (R-NY), and Misty Snow (D-UT) – are rated solidly in their opponents’ favor. Finally, while Caroline Fayard (D-LA) is still in the running for Louisiana’s Democratic Senate nomination (to be held on November 8th), that seat is considered solidly Republican. In 2012, a record 5 (4D, 1R) new women were elected to the U.S. Senate. Based on current ratings, up to six new women, all Democrats, could be elected to the U.S. Senate this year (Duckworth-IL, Harris/Sanchez-CA, Hassan-NH, Masto-NV, McGinty-PA, and Ross-NC.) There are no likely Republican gains for women in the Senate, and one Republican woman – Kelly Ayotte (R-NH) is at risk of losing her seat. Accounting for retirements and current ratings, the number of women in the U.S. Senate in 2017 is likely to range between 19 and 23, not departing dramatically from the current 20. California: Democrat Kamala Harris, if elected, will be the first multiracial woman elected to the U.S. Senate and the first woman of color elected to the U.S. Senate from California. Harris identifies as Indian-American and African-American. If elected, she would also become the first Indian-American Senator in the United States (3). Under California’s top-two primary system, Harris is running against another Democrat: Loretta Sanchez. Sanchez, who currently represents California’s 46th congressional district, would also become the first woman of color elected to the U.S. Senate from California if elected in November. She would also be the first Latina ever elected to the U.S. Senate. Illinois: Democrat Tammy Duckworth, if elected, will be the second woman of color elected to the U.S. Senate from Illinois. She would also be the first woman military veteran elected to the U.S. Senate as a Democrat; incumbent Joni Ernst (R-IA) was the first female military veteran elected to the U.S. Senate. Maryland: If Republican Kathy Szeliga is unsuccessful in her bid to fill the state’s open Senate seat, as current ratings predict, Maryland is likely to have its first all-male congressional delegation since 1973. Senator Barbara Mikulski (D), who is retiring this year, has served in the U.S. Senate since 1987 (and before that served in the House starting in 1977). Representative Donna Edwards (D), the other woman in Maryland’s 114th Congress delegation, was unsuccessful in her bid for the nomination to replace Mikulski in the Senate. Nevada: Democrat Catherine Cortez Masto, if elected, will be the first woman elected to the U.S. Senate from Nevada. She would also be the first Latina ever elected to the U.S. Senate (perhaps earning this honor alongside California candidate Loretta Sanchez). New Hampshire: As in California, New Hampshire has two women running for the Senate. The incumbent, Kelly Ayotte, is one of six Republican women senators in the 114th Congress. She is the first Republican woman to represent New Hampshire in the U.S. Congress. Her challenger, Democrat Maggie Hassan, is the current Governor of New Hampshire. If elected, she would join Democrat Jeanne Shaheen, who also served as Governor of New Hampshire, in representing the Granite State in the U.S. Senate. Pennsylvania: Democrat Katie McGinty, if elected, will be the first woman elected to the U.S. Senate from Pennsylvania. To date, Pennsylvania has sent seven women to the U.S. House, but currently has no women in its congressional delegation. According to current race ratings, McGinty has the greatest chance of all of Pennsylvania’s women congressional nominees of adding gender diversity to her state’s delegation in Washington, D.C. Finally, the three states that currently have women-only delegations in the U.S. Senate – California, New Hampshire, and Washington – are likely to maintain that distinction. An all-woman delegation is guaranteed in California and New Hampshire, where women are all major party nominees; in Washington, incumbent Patty Murray (D) is highly likely to be re-elected. (1) If Caroline Fayard is successful in her bid for the Democratic nomination in Louisiana on November 8th, she will represent the fifth female open seat Senate nominee in 2016. (2) To date, two women of color have served in the U.S. Senate: Carol Moseley Braun (D-IL) from 1993 to 1999 and Mazie Hirono (D-HI) from 2013 to present. (3) Harris is also poised to join other potential House newcomers Pramiya Jayapal (D-WA) and Lathicka Mary Thomas (R-FL) as the first Indian-American women to ever serve in the U.S. Congress.